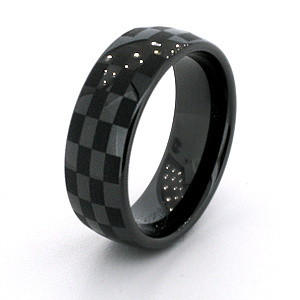 Solid black ceramic ring has checker design etched in surface. Domed ring with rounded edges. High polished mirror finish. Ring measures 8mm wide, approx 5/16 inch wide. Made in USA. Comfort fit. Our customers may exchange this ring as many times as needed for the lifetime of the ring for a different size. Return shipping fees apply. My husbands wedding ring. We are big into Drag Racing so this fit my husbands personality to a tee. He loves it. So unique! Got this for my fianc��� for is wedding ring and he loves it.